Alex is a junior on the Lakota East Boys Basketball Team. 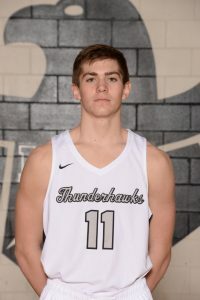 Alex has been an intergral part of the Thunderhawk varsity basketball program the past two years. He has made significant improvements each season to his game and helped the Hawks contend as one of the top teams in the conference. Alex is a strong rebounder, great defender and excellent three-point shooter. His contributions will be sorely missed the remainder of the season after suffering a leg injury against Oak Hills. We all wish him well as he recovers and prepares for his senior season. 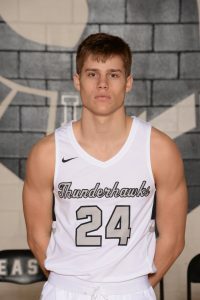 Will is a senior on the Lakota East Boys Basketball Team. Will is a two-year varsity player for Lakota East. His role this season as an excellent defender and outside shooting specialist has helped put his team in first place in the GMC. Will came off the bench Tuesday night to replace injured teammate, Alex Mangold, and provided the spark the Hawks needed for a big win over 1st place Oak Hills. In that game, Will poured in a career high 27 points that included six 3-point baskets, going 6-9 behind the arc.